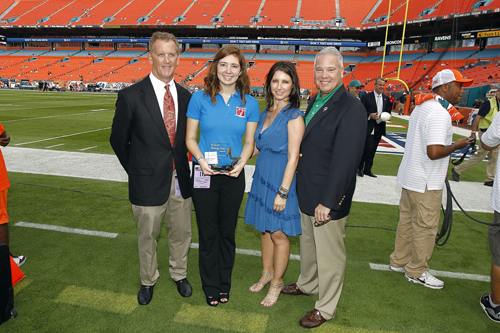 CCHS Senior Ashira Vantrees was honored by the Miami Dolphins with the Sun Life Rising Star Award at the home game on December 16, 2013. Vantrees entered an essay contest to be able to represent Women of Tomorrow, a mentoring program for “at-risk” high school girls for the scholarship award. The award recognized dedication to community service. Vantrees and three other South Florida students were awarded with $5,000 scholarships and the company that nominated them received $50,000. The Sun Life Rising Star Award acknowledged students that have overcome obstacles to reach academic success as well as non-for profit organizations that assist “at-risk” students across Broward and Dade County. The Sun Life Award, which partners with the Miami Dolphins, grants scholarship to students not only in South Florida, but also in Atlanta, Chicago, Boston, Philadelphia, Houston, and Phoenix. The program organized a special ceremony on the field at Sun Life Stadium for the award recipients. The honorees were applauded by “Fin” fans and had pictures taken on the field with Dolphins CEO Mike Dee and Sun Life Senior Vice President and General Manager of Employee Benefits Group Mike Shunney. The honorees were also awarded with a special breakfast where they heard each others individual stories about winning the award but also got to learn about the organizations that sponsored their fellow scholarship recipients. The experience has inspired Vantrees to continue volunteering as well as achieving success academically. Vantrees is heavily involved in the volunteer service in the Caribbean. She is currently preparing to go on a Volunteering Mission to Haiti and Honduras over Spring Break. Receiving a great honor and being recognized for her dedication just serves as inspiration for Vantrees as she continues to give back to the community through service.